These foods contain the essential nutrients that will aid in your recovery after workouts. What you eat after a hard work in the gym is just as important as your pre-workout diet. 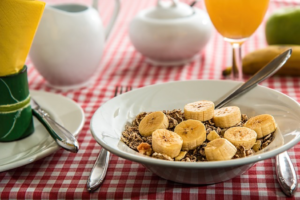 Your nutritional requirement may vary depending on your target goals, but there are basic foods that provide a right balance of essential nutrients in the body as well as aiding in recovery after workouts. During workouts, the body burns fuel the foods you’ve eaten before the workout as well as the stored glycogen. After working out, the muscles begin to absorb available protein and carbs to rebuild. That’s why you need to eat within 45 minutes of a workout so as to put your body in recovery mode. The primary objective of post-workout food is to supply your body with the essential nutrients to aid in recovery as well as helping you get the best out of your workout. This usually works best if you eat easily digestible foods containing carbs, proteins, and fats. Carbs: these include sweet potatoes, rice, pasta, oatmeal, fruits, quinoa, chocolate milk, dark leafy vegetables and rice cakes. Protein: these include eggs, salmon, cottage cheese, protein bar, tuna, chicken, greek yogurt and protein powder obtained from plants or animals. Fats: this category includes nuts, avocado, dried fruits and nut butter. A turkey or a chicken sandwich combined with a bowl of soup is a great post-workout food that gives wholesome carbohydrates for muscle recovery. Your body needs at least a half-cup of whole grains to help in recovery so ensure you consume foods such as brown rice, pasta, beans or quinoa. After the workout, your muscles are tired and the body is in need of easily digestible carbohydrates and enzymes to act on the nutrients as that they can be delivered faster to the muscles. Fruits are great such foods as they have easily digestible essential nutrients as well antioxidants, minerals, and vitamins. For example, the inflammatory properties of pineapples can greatly help in muscle recovery while kiwi is good for breaking down amino acids and digestion. Cereals can be taken any time of the day. After workouts, you should consume cereals containing high-fiber, low sugar, and high-protein to help reload your muscles. You can take cereals with dairy milk, or yogurt to make the combination more substantial. If your goal is to develop muscles, take oatmeal in addition to cereals after workouts to get additional carbs and fiber. Eggs are rich in proteins and other essential nutrients. Eggs are great post-workout meals as they are versatile food that can be taken at any time of the day. You can serve eggs in any form whether hard-boiled, or scrambled, or poached, and eat them together with a slice of toast, onions, peppers or avocado. Greek yogurt is highly enriched in protein and carbohydrates. You can mix it with cereal or blueberry fruits so as to help fight muscle soreness. Apart from the post-workout meals, you should also drink plenty of water following a workout. Water ensures that the body is properly hydrated and that the water lost during exercise through sweat is replenished for maximum results. Consuming the right meal after a workout is key to improving recovery and enhancing performance.